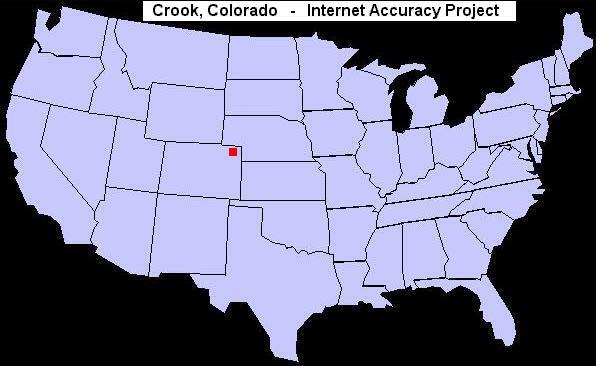 Crook is located in the northeastern corner of Logan County, in northeastern Colorado. Found just a few miles south of the Colorado-Nebraska border, Crook, Colorado sits just north of the South Platte River on U.S. 138. Crook, Colorado was named for General George Crook, a military commander in the region back in the early 1880s when the area was settled. Time Zone: Crook, Colorado is in the Mountain Time Zone. Camping, boating, fishing, hunting, water skiing, jet skiing, sailing, golfing, basketball, volleyball, bowling, hiking, picnicking, swimming, mountain biking, wildlife viewing, bird watching, cross-country skiing, snowmobiling, photography, ATV riding and horseback riding. Deer, antelope, coyote, fox, prairie dog, rabbit and squirrel. A few of the birds that spend time in the region include the cardinal, catbird, crow, dove, duck, eagle, goose, grouse, hawk, lark, magpie, oriole, owl, pheasant, plover, quail, robin, sandpiper, sparrow, turkey, warbler, woodpecker and wren. While Pawnee National Grassland located west of Crook, Colorado is recognized as a world-class birding location, the sparsely populated nearby South Platte River area is known for its pheasant, quail, dove, and waterfowl hunting. Excellent birding opportunities also exist locally throughout Logan County at several State Wildlife Areas listed above.